Michelangelo’s statue of David was on the cover of the August 21 New York Times Magazine, whose feature story was “David’s Ankles,” by Sam Anderson. Subtitled, “My obsession with the world’s most famous sculpture—its imperfections, its infinite reproductions, and its potential collapse,” it was the kind of story we turn to the NYT for: long form, in depth journalism; in this case informed by the writer’s particular interest in this statue. 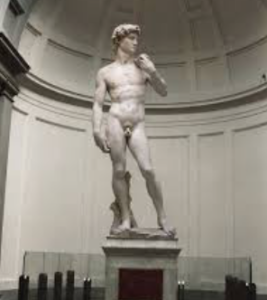 Anderson’s story emphasizes the popularity of “the David,” how people flock to see it, all the knockoffs of it, it’s “most famous sculpture” status. Yet it seems to me that the teaching of the story of David and Goliath has been lost sight of in the preoccupation with Michelangelo’s statue. Michelangelo’s David is beautiful, strong, eye-catching for sure, a riveting hero, but this is not the David of the biblical story; whose meaning is all about David’s apparent insignificance until he defeated Goliath. So one level of the teaching is that appearances, and expectations and judgements based on them, can be deceptive. From this point of view, Michelangelo’s sculpture should have been of an ordinary kind of person we wouldn’t look twice at if we passed him in the street. David’s own brothers, camped among the soldiers of Israel, dismissed him, even derided him as not belonging among warriors and shirking his work as a shepherd. Only David knew his own capacity. This recalls a proverb, given in Idries Shah’s “The Dermis Probe:” “None meets harm who knows his capacity” (p22). One of the levels of this saying is that we have depths of capacity that we have not yet discovered, and by discovering and engaging our hidden capacity we can become considerably more competent than we look, to those without perception. David’s strength and skill in battle came partly from his experience protecting the flock against lions and bears. But he was also inspired by, connected with, divine purpose. How do we discover and align ourselves with divine purpose? How can the skills that we have learned in our livelihoods–“protecting the flock against lions and bears”–apply to other, greater challenges and purposes? The story of David and Goliath highlights another dynamic: David wins, in part, because he brings a wider perspective to the situation, pointing a way forward through superior technology and strategy. Goliath’s armor and weaponry, his strength and his mastery of combat with the tools he knows, deters all challengers except David, with his slingshot.